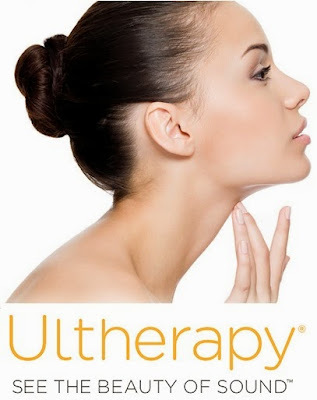 Ultherapy - lifting and tightening without going under the knife! I knew that if I held off long enough that science would come up with anti-aging procedures that wouldn't involve any cutting - and thankfully, I was right! One of he latest and greatest in non-surgery procedures is Ultherapy - the only non-invasive ultrasound treatment approved by the FDA and Health Canada for lifting the skin on the neck, chin and brow by using focused ultrasound to lift and tighten loose skin over time. The focused ultrasound is used to stimulate the growth of new collagen deep within the skin - which is important because as we know, collagen is a natural protein that gives skin its youthfulness by keeping it firmed and toned. As we age, collagen loses its strength and its ability to stand up to the effects of gravity that pull the skin downward. The thermal affect essentially jumpstarts a repair process that strengthens existing collagen and produces fresh, new collagen. - and as the production of new collagen occurs over time, the results aren't immediate but become more apparent over three to six months. The procedure only takes about an hour for most patients, costs between $1-$5K depending on the areas being treated, and there is no downtime. Lifting with no cutting, I was all over this one so I went to see my friend Dr. Cory Torgerson to see if this procedure could do something about my less then defined jawline and saggy chin bits. I purposely didn't read other people's experiences with it before I went because I didn't want to have any preconceived ideas on what it would be like - I realize what you really want to know here is if it hurts - and the short answer is no. Before the procedure I took a couple of advil and tylenols and Dr. Torgerson gave me a few numbing injections which really did the trick. I was told I could expect pain on an out of 10 scale of about a 4 but at the very worst it was a 2 and that wasn't even very often. Most of the time it didn't feel like much of anything - when I did it was just slightly painful - like having hot ashes from a cigarette flicked on my skin and that mostly happened for me right along the jawline and on my cheeks near my teeth with crowns. Having now read some of the reviews by people who had Ulthera without the numbing, make sure you go and see someone that will numb you, it does not sound fun without it! Afterwards my skin was slightly red for a couple of hours, over the next day I developed a couple of small welts along the jawline and for a week or so my skin felt mildly tender when I touched it. Now that it is a couple of weeks past the procedure I have no reminders of it at all except that my collagen should now be hard at work strenthening and improving itself! Immediately following the treatment, the skin on my jawline felt firmer and when I looked in the mirror I thought it even looked a bit tighter - but looking at the photos that were taken before and after, I can't actually see any difference so I'm not going to bother posting them because then you'll just be forced to see me without makeup for no reason and nobody should have to go through that! Over the next couple of months I can expect to see the results with a tighter jawline - can't wait! You can check out Dr. Torgerson's website for more info on the procedure - www.drtorgerson.com!